Animator/fangirl Leigh Lahav of OnlyLeigh has provided plenty of pop-culture parodies over the years—from Peggy Carter battling sexism to the five stages of watching a Marvel movie to a BB-8 “documentary” to Frozen Is The New Black. 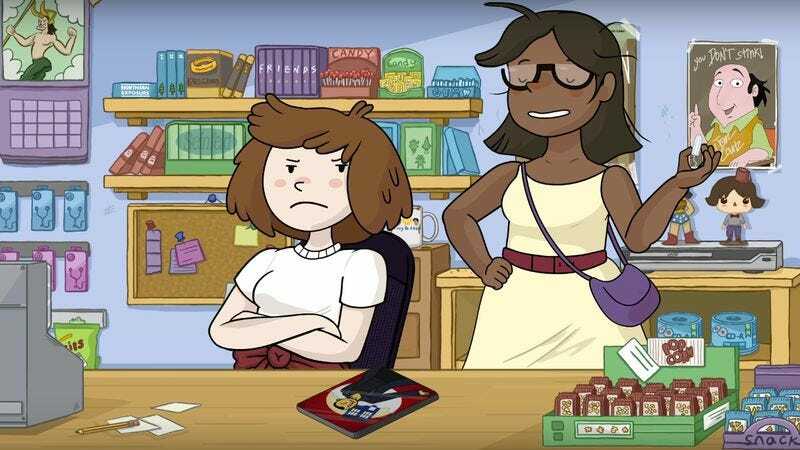 Now with the help of New Form Digital, she’s created her own pilot about two DVD store employees who travel through time. Appropriately named Belle & Tina Are Time Travelers, the pilot is crammed full of pop-culture references. Belle is a die-hard geek with a love of everything from Doctor Who to Back To The Future. Meanwhile Tina’s DVD-based time machine is controlled by movies, which should allow for some deep exploration of cinema history. According to Beyond The Cartoons, Lahav initially wanted to do a gender-bent parody of Bill & Ted’s Excellent Adventure before deciding to spin off the concept into its own original series. The pilot is a sweet, upbeat four-minute adventure with just a little bit of an edge (think Bob’s Burgers). Plus some casual tampon usage and a joke about irregular ovaries firmly establish the show’s unique, female-driven voice.